$80 Daydream View is the first in a series of lightweight VR headsets compatible with high-end Android phones, starting with Google's Pixel. The white light of the real world was visible out the bottom of Daydream View both for myself and a couple family members who tried the new $80 mobile VR headset from Google. After some tweaking to the head strap I found a relatively comfy fit, but others felt front-heavy pressure from the weight of the phone. In dark lighting and the seclusion of headphones, it blocks off most of the outside world. Even though the fit is odd — you can see around the side of the headset too — the Daydream View is a convenient package. It is the first mobile VR headset I’d want to take with me on trips carried loose in a bag. Side view showing spacing between face and headset in the Daydream View. I praised the last Gear VR as being one of the most comfortable VR headsets yet, but it can be a pain to get a phone fitted perfectly into the connector. Daydream doesn’t plug into the headset — it just straps in. And though Daydream View is lightweight, small and feels nice to hold, on your head its rigid body and single strap doesn’t match Gear VR. Google says the fit was designed to “work for a majority of faces.” It may not bother some people while others might find it very uncomfortable. I only accessed three games with Daydream prior to launch, and while they showcased an impressive range of input methods for the touch-sensitive pad and motion controls, Oculus had nearly two years to build up a library of content for mobile VR. While some of those experiences are being adapted to Daydream, like VR Karts Sprint and Keep Talking and Nobody Explodes, it is unclear just how many will end up making the jump. The Daydream controller and headset needed to be re-centered from time to time. Resetting is a simple process of just holding a button on the controller, but it is an annoying step to repeat. Daydream as a platform debuts with a limited set of apps, but the five initial ones from Google (YouTube, Photos, Play Movies, Street View, Arts & Culture) put some of the best of the company in VR, and provided wow moments for myself and family members. A ton of Cardboard apps might also find a second life upgraded for Daydream in the coming weeks. I tried Wonderglade (free with in-app purchases), which is a mini-game title that uses the controller to spray, spin or tilt through different levels. Mekorama ($4) is a diorama puzzle game while Hunter’s Gate ($6) is a shooter that makes clever use of the controller and promises multiplayer. In addition, Star Chart VR ($5) offered a simulation of the solar system and a free app from The Wall Street Journal offers a real-time market data visualization and 360-degree videos. While additional apps are available today, the above apps combined with Google’s own were the only ones we looked at prior to launch. Enhancing Daydream’s case versus the fire-prone Note 7 and its Samsung kin is the Pixel’s camera, which forces its way into your pocket after you’ve captured a couple photos with the eye-catching shallow depth of field effect. The Note 4, Galaxy S6 and Note 7 (Rest In Peace) all took good pictures in their respective generations, but the Pixel is on a different level. It features an automatically stabilized video camera that can make footage of my children running around look almost cinematic. That’s not something I’ve had in my pocket before and I don’t want to be without going forward. More than any other phone before it, the Pixel’s camera combined with Google’s services like unlimited photo backups — with the added bonus of inexpensive VR — makes for a combination that’s ready to supplant the iPhone in many pockets. Unlike Gear VR, Daydream View blocks the phone’s camera, with no passthrough option to see into the real world when in use. Google Photos got big wows from my family in VR. The app loaded panoramic photos automatically from my account, with pictures of rainbows and snow flurries taken months apart ready to view. A turn of my head let me examine features as if I was standing on my porch checking out the weather. There’s also an impressive 360-degree photosphere mode on the Pixel’s camera that stitches together your surroundings from a series of stills. There were still stitching errors — problems where the different photos met — but I was impressed by the quality of the finished sphere. The photosphere software existed before, but Google told UploadVR it is enhanced by the Pixel hardware. You could also try the Cardboard Camera app for stereoscopic captures. A private theater is the most likely use case for Daydream View at its launch, either on a flight with a downloaded Google Play movie or streaming on YouTube with the screen seemingly stretching across the ceiling of your bedroom. Moving and resizing the virtual screen into the perfect position with the simple motion controller is simple and delightful in YouTube, but I couldn’t find the same feature in Google Play Movies. You can also voice search in YouTube, which is a very nice touch. YouTube plays 360-degree videos too, of course, though you’ll likely need a high speed connection to stream high quality. Apps like Hulu, HBO Go and Netflix are on the way to join the Google apps. Street View elicited some of the biggest wows from both myself and other family members, with destinations visited ranging from our street corner to the Taj Mahal. Street View displays teleportation points that show you where you can go next with the controller, and the movement method was found intuitively by people who had experienced transporting from place to place in Valve’s The Lab. 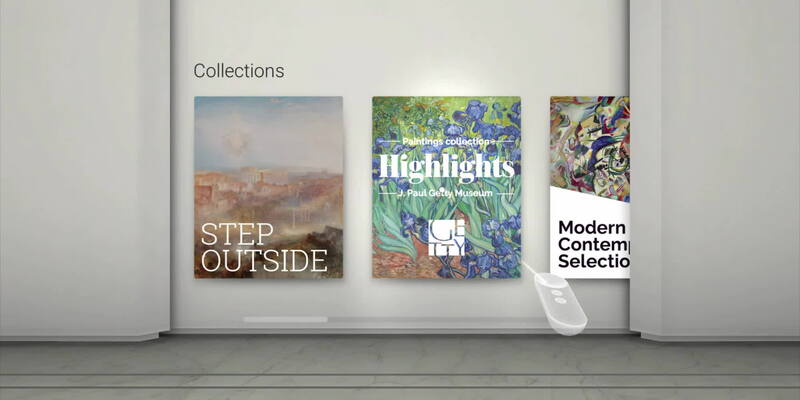 Google Arts & Culture is much like the Woofbert art musuem app, allowing you to skip the crowds at a museum but still get up close to the art. Daydream is already tied in tightly with Google’s services, leapfrogging the kinds of apps bundled with the initial Gear VR that collected together some sample 360-degree photos and videos. Instead, it carries the enormous library of YouTube and Street View captured imagery from around the world. These services mean View debuts out the gate as a worthy contender to the Gear VR powered by Facebook’s Oculus, but cross-compatibility may end up being the most compelling reason to consider Daydream over Facebook’s system. This cross-compatibility suggests that even if you invest $80 in a headset now and find the headset less than comfortable, a family member could get a different phone and headset later and you could mix and match. There was a ring around the lenses of Daydream View that seemed to catch the light in a very noticeable way. Other than that, the visuals of Gear VR and Daydream View subjectively seemed roughly on par. You have to reorient the controller from time to time and there aren’t too many apps available at launch. Google’s own internal apps are an impressive start for the Daydream platform, though, and it will be interesting to see what gets added in the coming months. The device gets very hot when using it in VR too. It might be worth waiting until there are more apps available, or for a Daydream-compatible headset with a more comfortable fitting. At the very least consider trying one out first before buying. That said, if you’re looking for something between Cardboard and Gear VR, Daydream View is far closer to Gear VR than it is to Cardboard.